Golden yellow flowers, good dense foliage and an easy care plant, Hibbertia scandens is a very useful plant in the garden. Grown both as a climbing plant and as a ground cover Hibbertia scandens with its large yellow flowers and glossy green foliage is an adaptable plant. Also commonly known as the ‘Snake Vine’, when grown as a ground cover it will form a dense sprawling matt to 50 cm tall and cover an area of 3m. As a climbing plant it will happily wind its way over a fence or pergola, in fact any support to around 2 – 3 metres. One of the major attractions of Hibbertia scandens is its long flowering nature, along with ease of pruning and reasonable drought tolerance this compact plant is useful in a range of landscaping situations. As the plant also tolerates salt spray and wind it is useful in re vegetation programs in coastal situations. Flowers are followed by a small rounded fruit containing the seeds. The flowers themselves are a pretty yellow and large, however the fragrance is not that pleasant. Water well when first planting, ensuring that the soil is well drained. 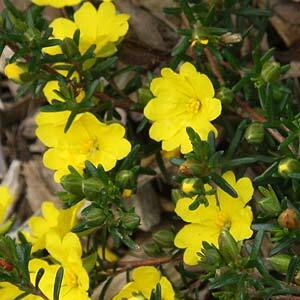 Water through the first summer, after this Hibbertia scandens is drought tolerant. Tip prune to maintain a more compact growth habit. Easily propagated from semi hardwood cuttings best taken in autumn. Try a 50 / 50 mix of peat moss and vermiculate which gives a free draining moisture retentive propagation mix. Take your cutting below a growth node, remove 2/3 of the foliage and provide some humidity. Hibbertia scandens can be lightly pruned after flowering to help maintain a bushy habit and contain growth if required. Height – 50 cm to 1m, however it can be trained as a climber.